Fun-filled summers where you can play all day. Camp Baco for Boys and Camp Che-Na-Wah for Girls is camp at its purest. We’re two separate camps built on a single tradition: the secret to great camp is its people. Camp Che-Na-Wah was established in 1923 and Camp Baco in 1951 as family-run camps along the shores of tranquil Lake Balfour in the Adirondack Mountains in upstate New York. The Wortman family has had the privilege to manage and then own both camps with love and care for over 60 years We believe that camp at its best is a series of magical moments that emerge from the backdrop that we supply. We provide the unspoiled setting, expert instruction, and careful supervision, the safety and structure for campers. We share the legends, traditions and values that have infused camp spirit from the start. We challenge, teach, nurture and cheer campers on, then we watch them soar. We are a community that is special among camps. Every year, 95% of our campers return for another spectacular summer; and new campers receive a warm and special welcome. With our team sports, swimming, tennis, the performing arts, and more, at Camps Baco and Che-Na-Wah, campers will have endless opportunities to do what they love and try new things, too! Our staff’s dedication, compassion and spirit help campers thrive. Our counselors, 80% of whom return each year, take pride in carrying on our traditions. 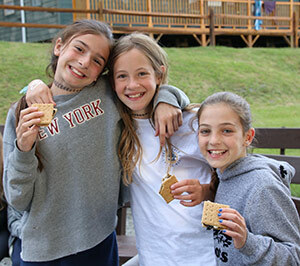 Where times have changed, Camps Baco and Che-Na-Wah – and what kids get out of camp – remains refreshingly constant: children play all day, learn new skills, challenge themselves, make lots of new friends, explore their own potential and, most importantly, HAVE FUN!